Make your front door more attractive with these tips! The end-of-the-year holidays are almost upon us. Last week, many of your friends and family showed up at your door, and in a few weeks, they’ll be back. But if your front door doesn’t look the part, your guests might think that they’re no longer welcome in your home. Here are some fantastic ideas for how to make your front door more attractive. Start by adding a new coat of paint to your door. Just by doing that, you can give your front door some new life. Repainting is also relatively quick, easy, and affordable to do. Start by using some primer formulated for your front door. Then pick some paint that has a beautiful sheen to it. Don’t overlook the importance of oil-based paints, either; these will also give you good results because the paint will look even better. Some color ideas you can try include red, yellow, blue, and purple. 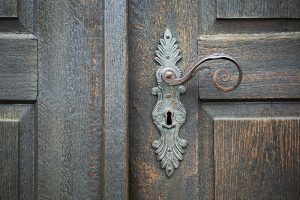 Even if your front door already has some molding around it, you might need to replace it. Whether you use patterns of squares or rectangles, you will need to attach the molding to your door using some special adhesive used for construction purposes. You can also use finish nails, but this depends on what your door is made of; if you see holes left by the nails, fill them in with nail putty. Once that’s done, you can proceed to prime to molding and paint it so that it blends in with whatever color you chose for your door. Another piece of advice has to do with the hardware on your front door. Trade out the old doorknob for a new one made of brass, bronze, or brushed steel. Then go one step further and add escutcheons, kick plates, and knockers. Even if you have a mailbox, you may want to add a mail slot to your door as well. Don’t forget about a new lock, either! Finally, consider decorating the doorway. Fill some pots with flowers that bloom in the winter. Put out a new welcome mat that reflects the change in seasons. Think about the outdoor lighting around your door too, because sometimes all you need is the right kind of lighting to make a stunning first impression. No matter what type of front door hardware and entry locks you choose, WalterWorks Hardware has the expertise and supplies you need. We are well known through the Maryland, Washington, D.C., and northern Virginia area for our fantastic hardware and unbeatable knowledge. For more information, please call us at (410) 263-9711 or contact us online. For more tips on choosing hardware for your home, follow us on Facebook, Twitter, LinkedIn, Houzz, Google+, and Pinterest. This entry was posted on Thursday, November 29th, 2018 at 2:10 pm. Both comments and pings are currently closed.